It is mandated by the State of Maine that each municipality employ an animal control officer (ACO) to investigate mistreated animals and control those that are deemed dangerous, abandoned or lost. For smaller communities, an ACO is often employed by more than one town. This is the case for Jessica Jackson, the Animal Control Officer who provides the required state services for the towns of Raymond, Casco and Naples. Jackson has been the area’s ACO since 2011. She has performed her job and responded to calls, concerns and complaints by using her own vehicle in the 125 square miles that comprise the three communities. Until recently, that is. 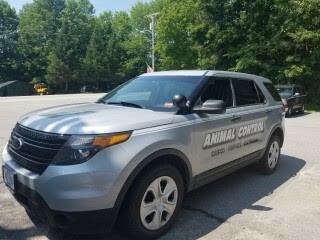 Once the Ford Explorer made its way to the Lakes Region, it received a new look with graphic lettering on the side doors and rear hatch establishing it as an Animal Control vehicle representing the Towns of Casco, Naples and Raymond. Jackson, who is also a licensed wildlife rehabilitator specializing in wildlife predators, urges everyone to keep a watchful eye on their animals, report them missing promptly, and attach ID tags along with registration tags. If they do go missing, please report it promptly. To report missing, abused or abandoned animals, Jackson can be contacted by calling the Cumberland County Dispatch Center at 800-501-1111.